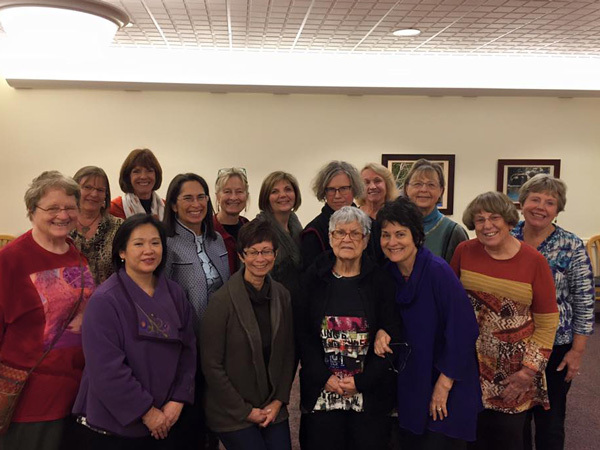 Everyone enjoyed the 5 days together with Jane at Auburn. 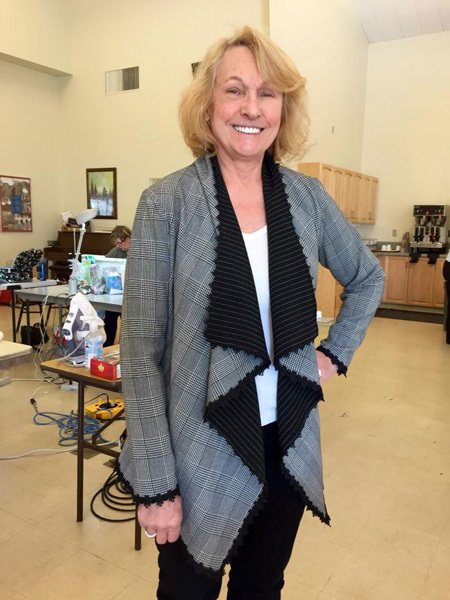 Santina made this lovely jacket using knits she bought on our New York trip. 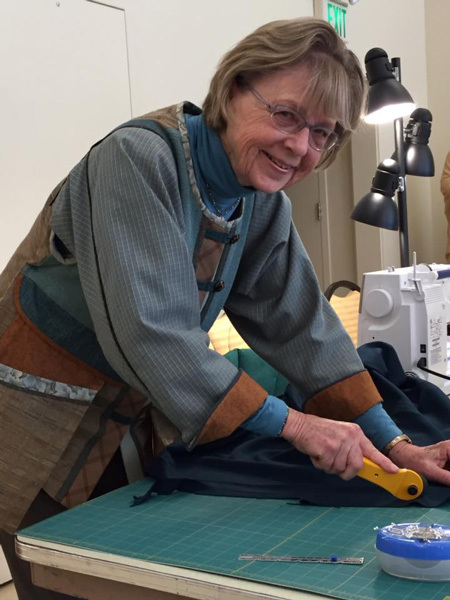 She worked with a Martha McClintock Saf-T-Pockets pattern called "Topnotch Tunic". Sally bought this fabric in Paris. 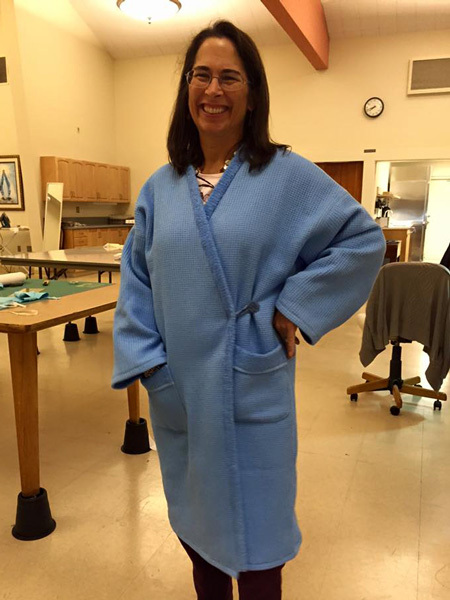 It was originally white but she dyed it this lovely blue, and now it's a cozy robe. 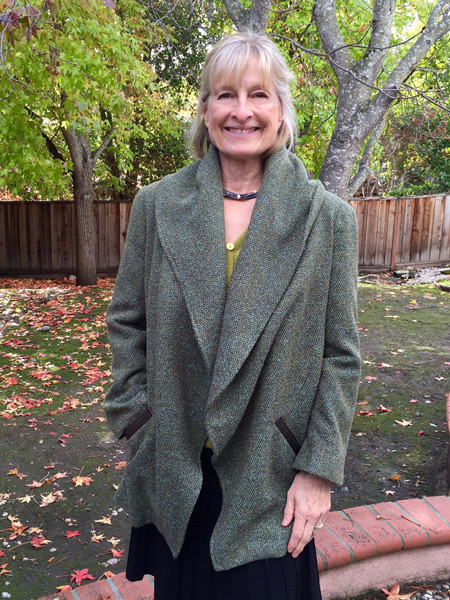 Diana bought this lovely reversible wool at Britex and cleverly made the jacket look more feminine by adding a trim. 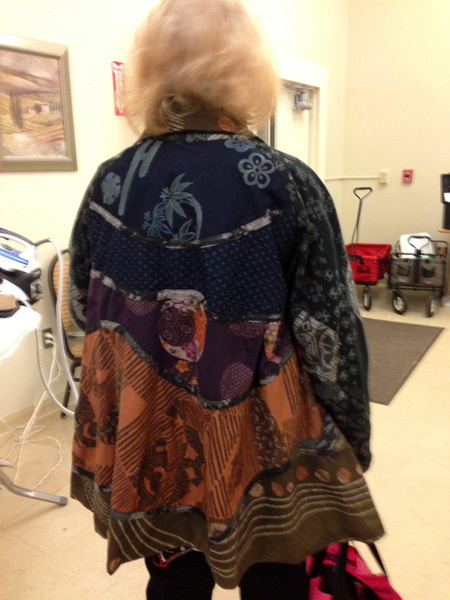 This is the back of Diana's coat she made from Japanese fabric and Vogue's Koos pattern. 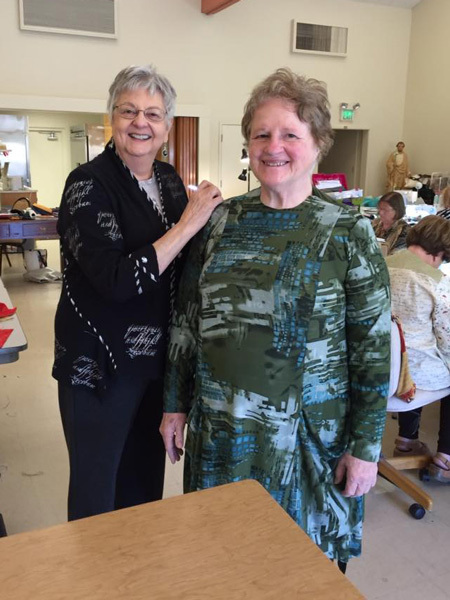 Barbara is cutting out a dress, and wearing a top created from Diana Ericson's Java Jacket pattern. 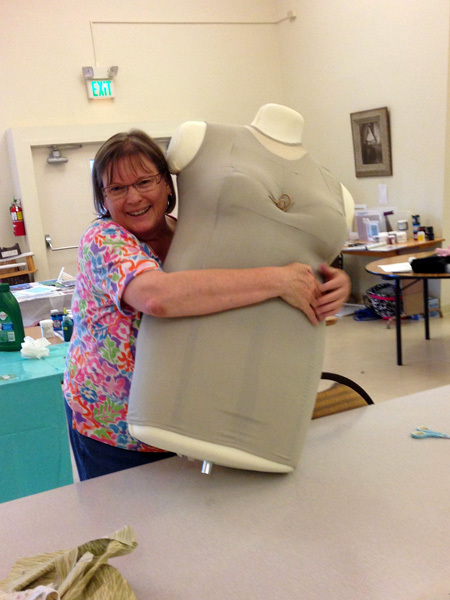 Diana was so happy to have Jane help her make this dress form. 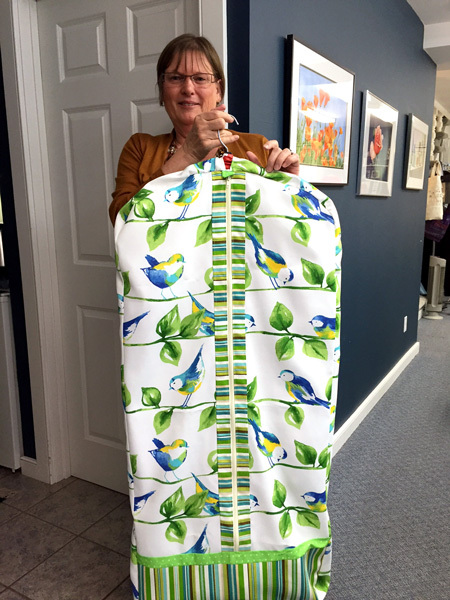 Diana created this colorful garment bag. 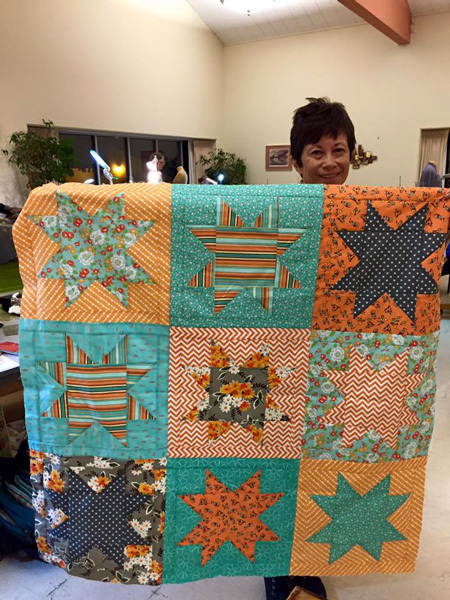 Pat finished this quilt top, and some lucky person will soon receive a fabulous gift. She completed her jacket and it looks great. Sharon loves her new tunic. 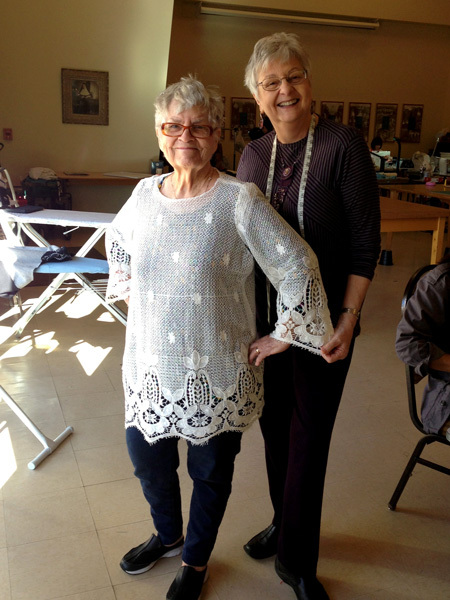 Sylvia is wearing a tunic she made from the fabic her daughter found for her while on the New York trip with Jane. 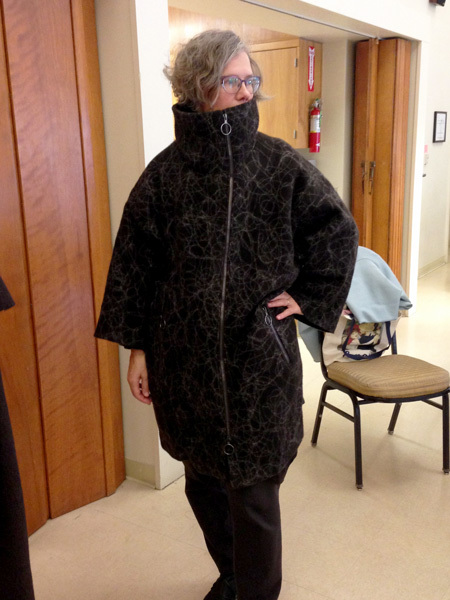 Maria finished her coat. She made many changes to the original Vogue pattern. There are welt pockets and back tucks trimmed with leather strips in a copper color. 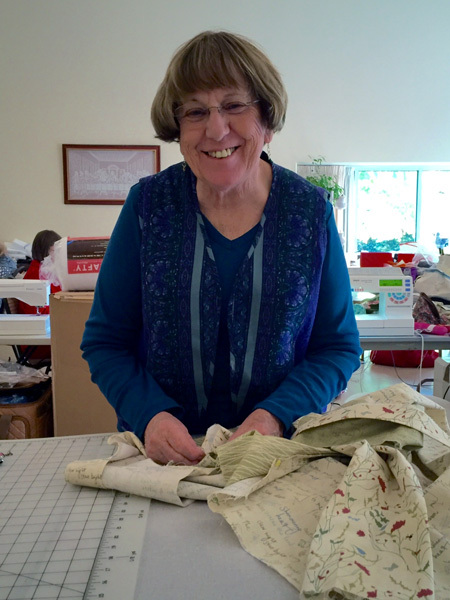 Betty is working on a cotton blouse and used some of the scraps to make a purse. 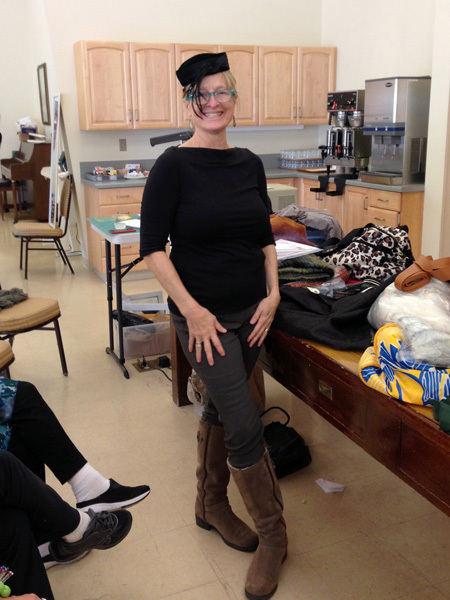 Maria modeled some vintage hats. 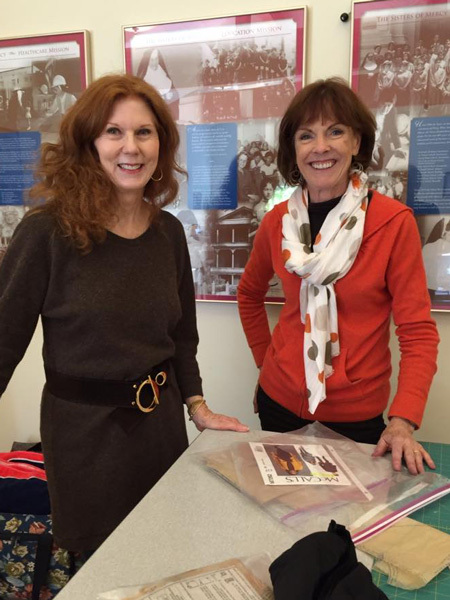 Jackie, Barbara, and Jeanne shared a sewing area and had a wonderful collection of machines, projects, and fabrics. 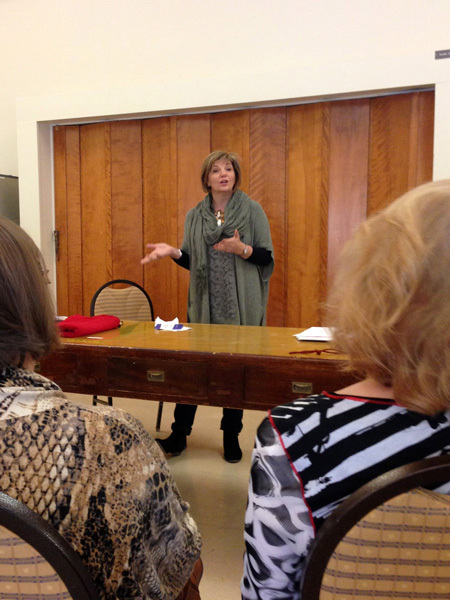 Our week started out with a inspirational trunk show by Jasna. She has made many patterns from ready to wear garments, and then used these patterns to create wonderful outfits. The first garment she showed us was the felted wool coat above. 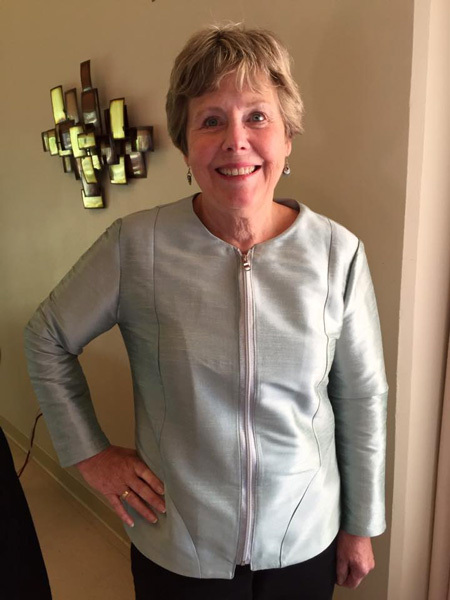 She created this garment by copying the pattern of an Ann Klein coat. One of the last garments Jasna showed us was the above dress. 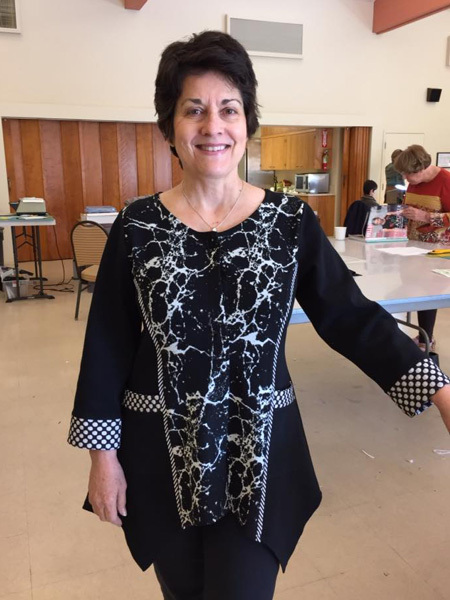 She had found a black dress at a shop in Carmel, CA, and copied the pattern. She made about 4 or 5 dresses using this pattern and just changing the fabric for different looks. 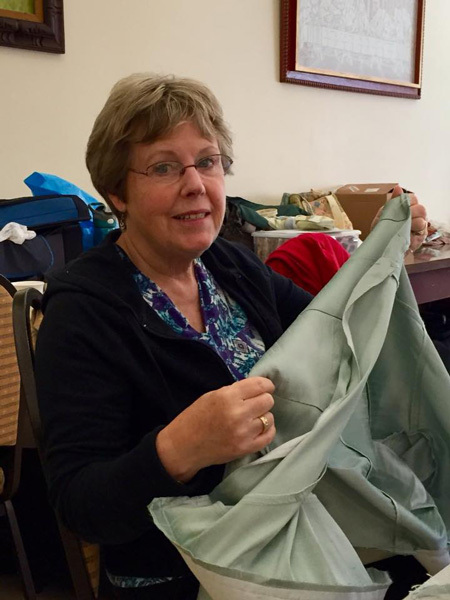 Sally generously gave us a session on silk screening. She showed us how she makes silk screens and how to use the tools. 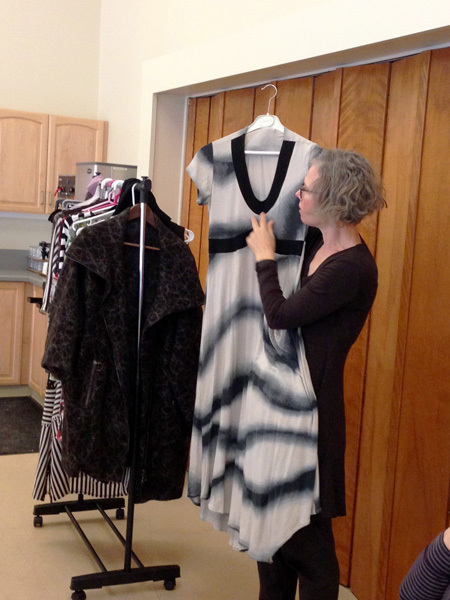 After her talk she allowed us to use her screens and paint to design on our own garments. It was really fun, and we all appreciated Sally giving us this experience. 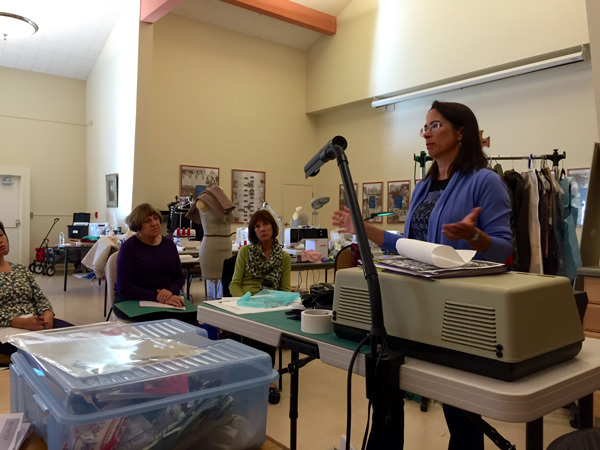 Barbara gave us a session on the points to remember when using a sewing machine. One of the points was to be sure to change the needle whenever the stitches do not seem quite right. Sharon had just returned from a sewing trip to New York with Jane, and she shared her "stash". She had purchased many interesting fabrics, and had already paired a lot of them with patterns. 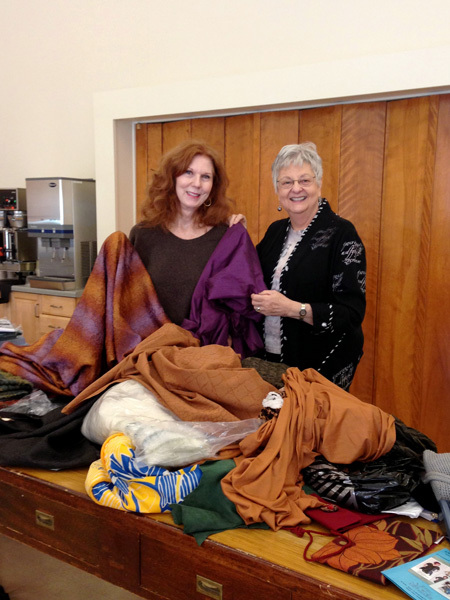 Sharon and Jeanne enjoy looking at patterns and discussing how they both will use their fabric from New York.